I think most of us have been inspired to collect something over the years. Knickknacks, craft supplies, books – we’re all susceptible. Today I want you to tell me what you have collected and that’s why our Ten on Tuesday topic is 10 Collections I’ve Had Over the Years. Dala horses. These may have been the first thing I ever collected. I got my first one at the Kaffe Stuga at the Lutheran Church in my neighborhood when I was just a girl. I got my most recent one just last year. Strawberries. Well, not strawberries but stuff with strawberries on them. Monogrammed sweaters, prints, pillows and other home decor. My room my freshmen year of college was covered in strawberries and I’m surprised my roommate tolerated it. Snowmen. My collection of snowmen started the first year I was married. I picked one up at a craft fair and that was the start of a lifelong, ummm, obsession. Longaberger Baskets. I have many. Many, many. At least this is a useful collection. Seashells and seaglass. I go to the beach for vacation pretty regularly. This one is a gimme. Pappagallo Purse Covers. Do you remember those? I was quite the prep in junior and senior high school and I had these in every color and for every season. Decoys. This is probably more of a collection of Dale’s but we have them throughout our home. We don’t have any truly valuable ones but I love them for their folk art appeal. Yarn. And also, fabric. This counts as a collection, right? I mean, my Vesper Sock Yarn is a collection unto itself. Cookbooks. I don’t really collect them now that most recipes are online but I had a lot back in the day. I actually still have some of my favorites and I won’t give them up. Scrapbooking Supplies. Back in the days before digital cameras I did a lot of scrapbooking and therefore amassed a lot of stickers and cardstock and other fun scrapbooking stuff. Collecting is fun, right? Not an obsession at all, right? If you wrote a post for today please leave your link below. If you want to receive the weekly Ten on Tuesday email please click here to sign up. Your Dala horses and decoys are beautiful. I wonder why we collect what we collect? Snowmen? You? I thought you would think them spawn of the devil season. Lovely collections, all, Carole! I think it’s really interesting to reflect back on the things we are drawn to. it’s definitely not an obsession – especially if it adds beauty and/or utility to your life. Seems like yours (mostly?!) do! 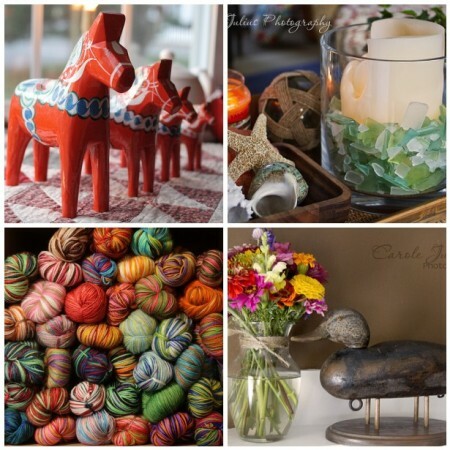 love the dala horses and the yarn (see beauty AND utility) and oh my! Pappagallo purses – I had a huge collection of covers in college…do you still have them? I didn’t know about some of your collections, although I knew Vesper yarn would be one you listed. Love the horses and the sea glass most of all. I have one Dala horse and I treasure it. It came from my niece’s husband who’s a native Swede. We’ve got some decoys too…I love what they bring to the décor too! I have another friend who collects strawberries too. Her kitchen is covered in them! Longaberger baskets are a nice thing to collect. And yarn – well no words necessary. I hadn’t heard of the Dala horses before. Those are adorable! We have duck decys and cookbooks in common. It’s funny because I usually search for recipies online, but still enjoy ‘reading’ the cookbooks. I’d never heard of those purse covers before! I still love my cookbooks!! Fun! I am trying to get rid of things, though. The weight of stuff has been weight on my soul lately. Vicki doesn’t know about Pappagallo? Must be a New England or Boston or just plain weird preppy thing. I had one set of handles and a couple of covers, but I never got too into them. Ha. I did NOT have a Pappagallo, and oh, how I longed for it! Your Dala horses are gorgeous! !